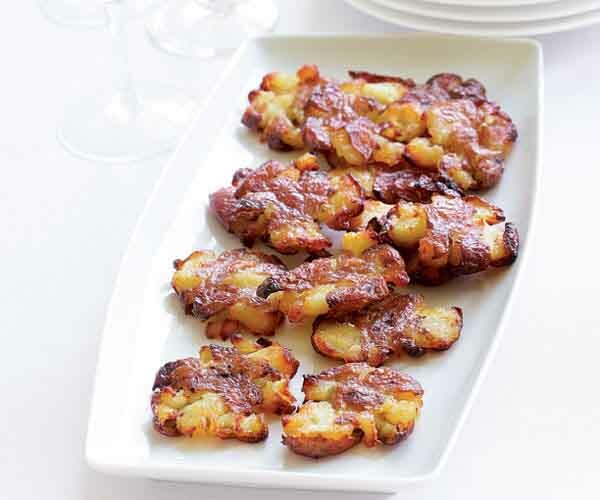 With a simple ingredient list and a mostly make-ahead technique, these delicious potatoes are perfect for parties. Of course, you don’t have to have a party to make these. They’re just as good served with Sunday dinner as a side dish with roast chicken or meatloaf. And garnished with a bit of sour cream and chives, they make a nice starter. Subscribe to Fine Cooking magazine for more super-simple techniques like this one, as well as recipes and techniques for home cooks of every skill level. 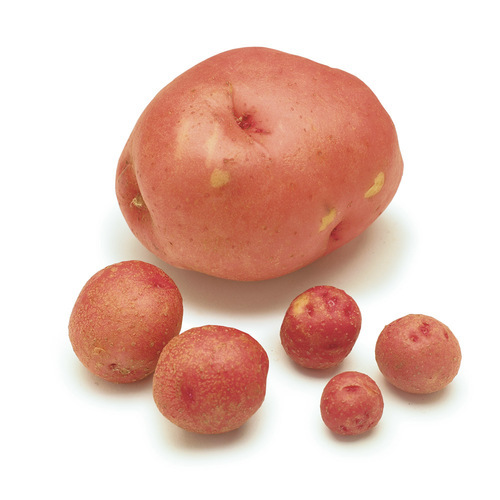 Put the potatoes in a large saucepan (preferably in one layer) and cover with at least an inch of water. Add 2 tsp. kosher salt to the water. Bring the water to a boil over high heat, reduce to a simmer, and cook the potatoes until they are completely tender and can be easily pierced with a metal or wood skewer. Make sure they are cooked through but don’t overcook. The total cooking time will be 30 to 35 minutes. While the potatoes are cooking, set up a double layer of clean dishtowels on your countertop. 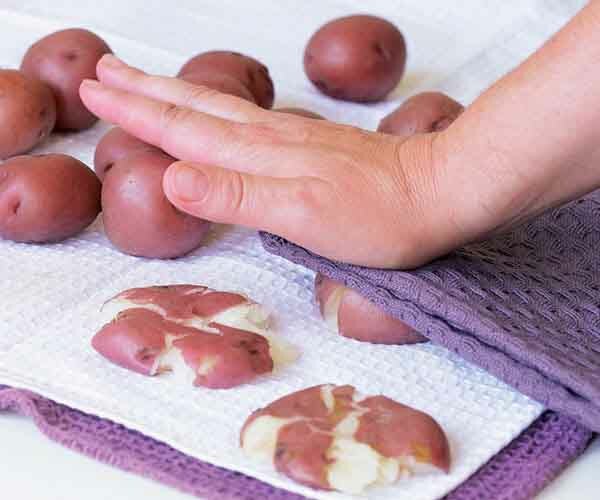 As the potatoes finish cooking, remove them individually from the water, and let them drain and sit for just a minute or two on the dishtowels. Fold another dishtowel into quarters, and using it as a cover, gently press down on one potato with the palm of your hand to flatten it to a thickness of about 1/2 inch. Repeat with all the potatoes. Don’t worry if some break apart a bit; you can still use them. Remove the pan of potatoes from the refrigerator, if prepared ahead. Heat the oven to 450°F. Alternatively, if you have a convection function, turn it on and set the temperature at 400°F. Sprinkle the potatoes with about 3/4 tsp. salt and pour the olive oil over them. Lift the potatoes gently to make sure some of the oil goes underneath them and that they are well coated on both sides. Roast the potatoes until they’re crispy and deep brown around the edges, about 30 minutes if using a convection oven, 30 to 40 minutes if roasting conventionally, turning over once gently with a spatula or tongs halfway through cooking. Serve hot. Do the busy work—boiling and flattening the potatoes—up to 8 hours ahead. Let potatoes cool completely, and store them on the pan, lightly covered, in the fridge. Then all you have to do at the last minute is coat with oil and salt and roast. Scrumptious! 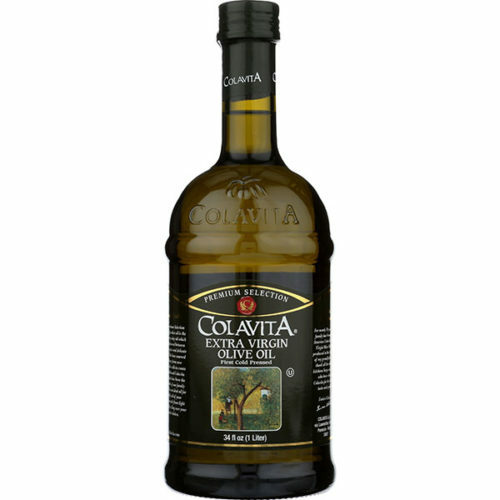 Use a flavorful fat, such as bacon fat, duck or chicken fat...soooooo gooooood! I have made this recipe many, many times; it is one of my favorites. I never use anywhere near a 1/2C oil!! I drizzle the potatoes with oil & then flip them to get both sides coated. Probably no more than 1/4C oil, if that. This recipe in no way serves 4!! Using the tiny potatoes called for in the recipe, 1 person can easily eat 5 or 6; they are seriously yummy! Great with Cedar Plank Salmon recipe also on this site. I have made this recipe a number of times, and used to get variable results, probably due to either skimping too much on the oil (1/2 cup is just so much! ), using slightly too large potatoes, and/or crowding the potatoes on the sheet pan. I am now getting consistently good results using smallish potatoes, 1-1/4" to 1-1/2" in diameter, cooking at 435 degrees using the convection/bake combination setting. I still reduce the oil, but generously coat all surfaces. Oddly enough, my last batch may have been the best -- I forgot to flip the potatoes midway though, so they had probably 35 minutes on the first side and only 5 or 10 on the flip side. The extra time made for a super crispy potato! Next time, I'll flip them a little sooner, but will wait to flip beyond the halfway point until they look very crispy at the edges. Whatever you do, do NOT forget to salt the cooking water, I did that once and the resulting potatoes were really bland.